With promises of “the right balance” at some time in the future, clearcutting on Crown land continues unabated including cuts close to Protected Areas. The latest announcement cites plans for 67 parcels, 52 of which are 1-stage clearcuts, 15 are partial cuts. 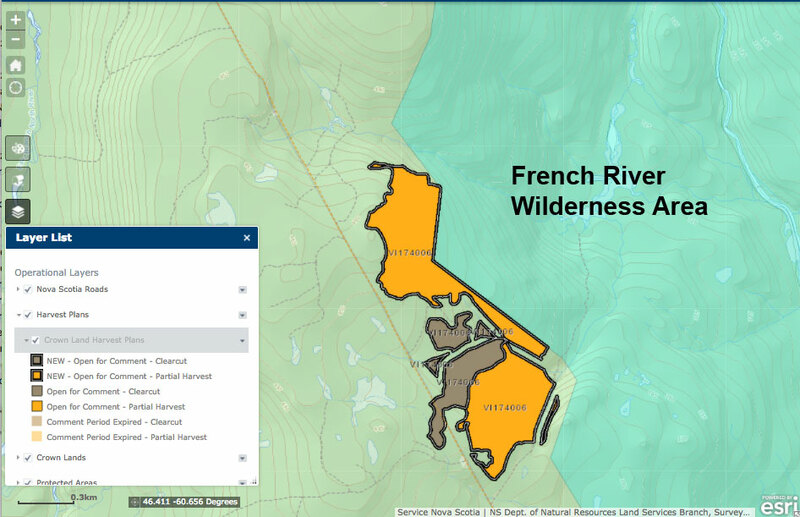 As usual, they include cuts on the border of a Protected Area, in this case that of the French River Wilderness Area in Victoria Co., Cape Breton. Please note this change regarding the Harvest Plan Map Viewer: We are temporarily extending the commenting period for the planned forest harvests which are open for comment today on the Harvest Plan Map Viewer. This will ensure the department’s response to any concerns raised is not affected by this time of government transition. The expanded comment period will apply to harvest plans currently open for comments on the map viewer, and those that were closing for comments yesterday. It will also apply to new harvest plans added during today’s scheduled update. All these posted harvest plans will remain open to comments from the public for an additional period beyond the standard commenting period of twenty days. Concerns brought forward are considered during the planning process. I guess that is laudable, but one might wonder why the extension was not initiated concurrent with the election announcement on April 30 and applied to announcements on May 1, May 11, May 23, 2017; June 1, 12, 2017. It was certainly difficult to engage any MLAs on bureaucratic issues during that period. If the government really valued feedback on the harvest plans, they would announce the plans at least a year ahead of time “so that people in the community can look…and then have the ability to let government and the company know about any problems they see with that particular operational plan” as Eric Zscheile has said. Did Markus Kehoe put his finger on the issue when he said: “they’re going after the premium stuff from pre-existing roads.”? This entry was posted in clearcuts, Conservation, NSDNR, Parks & Protected Areas. Bookmark the permalink.